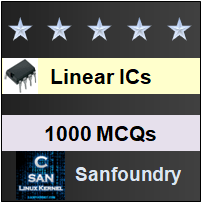 This set of Linear Integrated Circuit Multiple Choice Questions & Answers (MCQs) focuses on “Open Loop Op-Amp Configuration”. Explanation: In an open loop configuration, the output signal is not fed back in any form as part of the input signal and the loop that would have been formed with feedback is open. 2. In which configuration does the op-amp function as a high gain amplifier? Explanation: An op-amp functions as a high gain amplifier when connected in open loop configuration. These three are the open loop configuration of an op-amp. 3. How does the open loop op-amp configuration classified? Explanation: Open loop configurations are classified according to the number of inputs used and the terminal to which the input is applied when a single input is used. 4. What will be the voltage drop across the source resistance of differential amplifier when connected in open loop configuration? 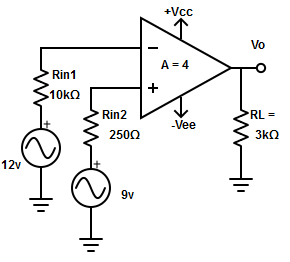 Explanation: The source resistances are normally negligible compared to the input resistance. Therefore, the voltage drop across input resistors can be assumed to be zero. Explanation: The output voltage is equal to the voltage gain times the difference between the two input voltages. 6. Calculate the output voltage for the given circuit. Explanation: The output voltage, Vo = A*(Vin1-Vin2). (Since, Rin1 and Rin2 are negligible compared to input resistance in open loop differential amplifier). => Vo = 4*(12v-9v) = 12v. 7. Find the output of inverting amplifier? Explanation: In an inverting amplifier the input signal is amplified by gain A and is also inverted at the output. The negative sign indicates that the output voltage is of opposite polarity. 8. Determine the output voltage for the non-inverting amplifier input voltage 37µVpp sinewave. Assume that the output is a 741. Explanation: The output voltage for non-inverting amplifier Vo = A*Vin = 200000 * 37µ = 7.4 Vpp sinewave. 9. Find the non-inverting amplifier configuration from the given circuit diagram? Explanation: In a non-inverting amplifier, the input is applied to the non-inverting input terminal and the inverting terminal is connected to ground. 10. What happen if any positive input signal is applied to open-loop configuration? Explanation: In open-loop configuration, due to very high gain of the op-amp, any input signal slightly greater than zero drives the output to saturation level. 11. Why open-loop op-amp configurations are not used in linear applications? Explanation: When operated in open loop, the output switches between positive and negative saturation levels. For this reason, open loop op-amp configurations are not used in linear applications.